Sept. 19, 2013, 10:50 a.m.
Is Reuters back at square one in its quest to become a bigger consumer news brand, or is abandoning a troubled project the best way to build on its existing strengths? By Justin Ellis @JustinNXT Sept. 19, 2013, 10:50 a.m.
Reuters’ vision of the news service of the future — or at least the consumer-facing part of that vision — will look a little bit more like the present. Wednesday morning, the company announced it was scraping its plans to remake Reuters.com into a consumer-facing digital news hub. Instead, the company will shift its focus back to the current Reuters.com as the main hub of news and information. Reuters Next was conceived as a complete overhaul of Reuters.com as well as the back end systems that deliver news and updates from journalists and editors around the globe. In May, the company unveiled a preview version of the new site, a unified design that merged article pages and topic pages, where every story could act as a jumping off point in a constantly updating river of news. Big news at Reuters: Reuters Next is being cancelled, @nycjim and @kylestanding both leaving. Very, very sad day. …the project as a whole has struggled to meet delivery deadlines and stay within its budget. Also, it does not capitalise on our strengths. We need to take advantage of the fact that we have a constant stream of high-quality, real-time news (something most news organisations lack), created by more than 2,000 journalists around the world; we need to focus on our unique photography and video to win in an increasingly visual media world; and we need to make our core strength of international news relevant to local audiences – which means, among other things, having local-language sites. 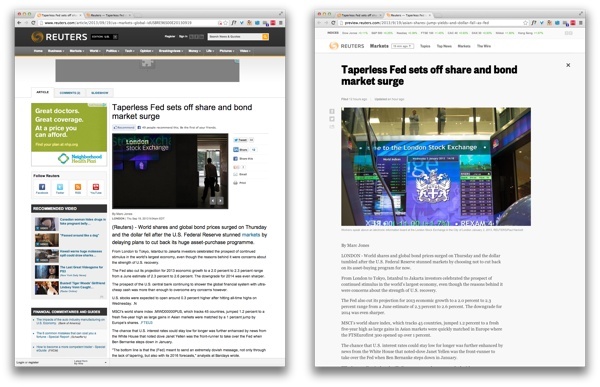 The same story in the current Reuters.com (left) and in Reuters Next. Where exactly the media division of Thomson Reuters needs to go is the big question. Barb Burg, a spokeswoman for Reuters, told me Wednesday that “at this point, we don’t have anything to say beyond what is in the memo. We’re putting together plans and there will be more to come.” Rashbass, who was chief executive at the Economist Group before joining Reuters in May, was skeptical of Next from the time he arrived, according to BuzzFeed’s Matthew Zeitlin. While the particular internal dynamics of Next’s demise are unique to Reuters, in one sense it’s just the latest iteration of the conflict wire services have felt since the web’s arrival. Pre-web, they had solid B2B businesses, serving as suppliers to the newspapers, television stations, and others who had the direct relationship to consumers. On one hand, the web meant a new set of potential customers. (Indeed, Reuters’ 1995 deal to license some of its stories to Yahoo News was one of the key early moments in the rise of free-to-consumer online news.) But it also meant that it was possible to reach customers directly for the first time. So Bloomberg, which has an enormously lucrative terminal business, also puts much of its news online for free. The Associated Press offers up The Big Story. And Reuters has both its current Reuters.com and what was to be Reuters Next. The thinking is obvious: We have all these reporters and editors (over 2,000 in Reuters’ case), all around the world, and we’re producing all these stories and videos and photos — can’t we figure out a way to get them in front of readers and viewers without a middleman? In that big consumer news war, the competition is all the English-language global news competitors, those Digital Dozen companies that only get stronger each year compared to more regionally focused companies. Global news dominance — a new quest sometimes cited — can’t be achieved if it remains a middle-of-the-mind U.S. brand. To win that consumer battle, Reuters must wrestle with this fundamental question: Who is the reader? Reuters would like to be a big, U.S.-recognized news brand, but it wants to emphasize serving professionals’ news reading habits. That’s a niche within a consumer niche, increasingly cloudy as the business and leisure reading worlds merge, in time and device. We reach hundreds of millions of people indirectly through selling our stories, pictures and videos to some of the world’s biggest media companies who publish and broadcast them. It is vital for us also to present our news directly to consumers first, because doing so is a source of revenue and potential profit for our business; second, we can’t achieve our aspiration of being the greatest news organization in the world without a direct consumer audience; third, it is important for our brand strength, for the reach we need so that big names with big news want to speak with us and for keeping us an attractive place for the best journalists; and finally, a successful consumer offering allows us to find new customers for all parts of Thomson Reuters. Rashbass doesn’t seem to think Reuters Next was on the road to accomplishing those goals. Reuters Next was only the the most recent step in the company’s push towards becoming a better recognized brand for consumer news; their results have been a mixed bag. In January 2012, they launched Reuters TV, a video initiative in conjunction with YouTube’s channels program, that produced shows and segments featuring Reuters journalists like Felix Salmon, Anthony DeRosa, and Chrystia Freeland. The channel’s still there, but a year later, YouTube dropped its funding of it. In February 2012, the company debuted Social Pulse, a monitoring tool for business-types designed to help track companies and titans of industry across social media. It’s a “Page Not Found” today. Reuters has also lost some key digital news staff: Freeland stepped down from her post as managing director and editor for consumer news for the understandable allure of a Toronto-Ottawa commute; DeRosa is now the editor-in-chief of Circa; Smalera, Reuters Next’s product manager, moved over to The New York Times. In his memo, Rashbass indicates that the teams responsible for the editorial and business aspects of Reuters.com are still being put together. For the time being, the preview version of Reuters Next still exists, but one imagines it’ll soon be relegated to the great media graveyard, resting somewhere near TimesSelect and the ESPN phone. Of course, today The New York Times has built a digital subscription model much more successful than TimesSelect ever was, and many of us live and die by the ESPN video and alerts we get on our phones. In both cases, each company incorporated the lessons from those projects into future strategy. Perhaps Reuters will end up doing the same. POSTED Sept. 19, 2013, 10:50 a.m.
Ellis, Justin. 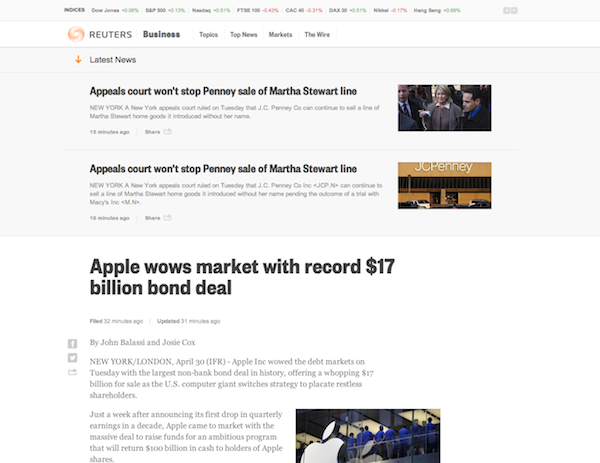 "Reuters nixes Next: Failed redesigns and the challenge of expanding a digital audience." Nieman Journalism Lab. Nieman Foundation for Journalism at Harvard, 19 Sep. 2013. Web. 18 Apr. 2019. Ellis, Justin. "Reuters nixes Next: Failed redesigns and the challenge of expanding a digital audience." Nieman Journalism Lab. Last modified September 19, 2013. Accessed April 18, 2019. https://www.niemanlab.org/2013/09/reuters-nixes-next-failed-redesigns-and-the-challenge-of-expanding-a-digital-audience/.